Two summers ago my dear friend gave me a GORGEOUS 6 paned window that she had painted my favorite color – teal – and painted the glass with chalkboard paint. This beautiful window has been sitting behind my couch ever since then because I have had no idea what to do with it. Well folks – I finally know what to do! At one point I thought I would put the weeks meal plan on it because meal planning is all the rage and apparently its what all super organized people do. Well I quickly learned that I am so not organized enough. I am more of a fly by the seat of my pants type of gal. I like to open the fridge and start making stuff with what ever happens to be in there and needs to be used up. So a meal planning chart was out of the question. Then I thought about just putting some pretty pictures on it and maybe a bible verse and while that is really cute – at the time I only had pictures of the hubs and I. We don’t need that many pictures of just us hanging in our house. But today I was browsing the interwebs and I saw a fantastic idea – a chore chart! BRILLAINT! Growing up, my mom had a chore chart in the back hallway where no one could see it. She made it out of a big piece of poster board, sticky notes, and a permanent marker. Really, it was great – it did its job and it was super effective. But I don’t have anywhere in my house that I could hide something like that. So I want my chore chart to be pretty (that and I am kind of an overachiever (read: OCD) with the decorations) and since I have this gorgeous window already made – I’m going to use it. If you want to make your own Rustic Chic Chore Chart – all you need is a 6 or 8 paned window (painting it is optional), and a white erase marker OR chalk if you choose to use chalkboard paint. I have a 6 paned window and that works great for my family because we do not do chores on Sundays – its Gods day so we do our best to rest… or we just play catch up from the rest of the week.. If you like to plan your Sundays out though, get the 8 paned and use the extra one for something fun – a verse, quote or inspiring picture or maybe something not so fun – like extra chores. 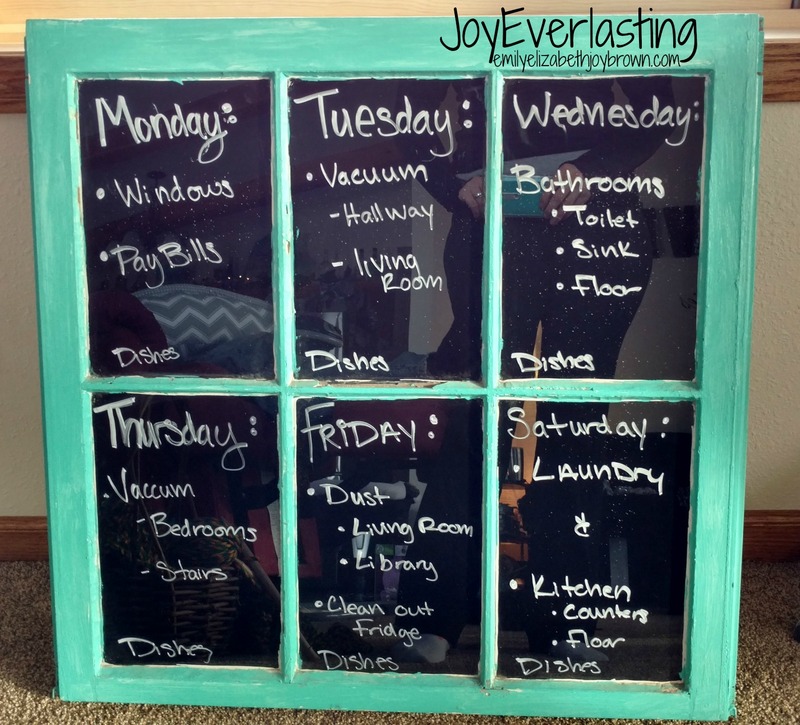 All you need to do is label each box with a day of the week and then write out which chores need to get done that day. Hang it on your wall and then you are all done!